I have very strong opinions about guacamole. Fortunately for all of our sakes, this isn’t the kind of site devoted to didactic culinary lectures; it’s not that my way is right and your way is wrong. [Don’t I sound so mature today?] If you love guacamole with chopped tomatoes, or red onion instead of white, lemon instead of lime or, like a former president of the United States, with garlic in it (shudder), you should just go ahead and keep doing you. You’re cooking for you, not me. And I will eat it, preferably with a salt-rimmed margarita or paloma. I have never turned guacamole away; I am not a monster. But, ahem, my way is so much better! [Welp, the high ground was fun while it lasted.] My favorite guacamoles are more like an avocado salad with a minced white onion, chile and cilantro flavor bomb of a lime dressing. I make it first, right in the bottom of the bowl. I do not skimp on the lime but I basically never do with citrus. Then, you score up your avocado halves, scoop them in and gently turn to coat them in the dressing. Taste for salt and flavors and adjust everything to your liking. You’re done! Or, you can start mashing the chunks a bit with a fork agains the side of the bowl but I urge you to proceed with caution. What has been mashed can never be un-mashed. If you’re using guacamole as sauce, go ahead and smash it up. If you, like me, like it rather chunky, go easy on it. If your avocados are ripe to the point of basically already being avocado butter, well, the avocado has chosen its textural fate and we must respect its wishes. What’s most important is that even if you come around to agree that this is the best way, you cannot tell others who are making guacamole for you their favorite way or they might stop and then you will have less guacamole in your life. I think we can all agree that even imperfect guacamole is better than no guacamole. I always thought I was relatively alone in this approach of a minced vinaigrette coating an avocado chunk salad — most guacamoles I see are much chunkier or blended to a full paste — until I found my guacamole kin in chef Roberto Santibañez’s version in his 2011 Truly Mexican book as showcased in Food52’s Genius Recipes column and book. The levels of each ingredients are slightly different and it’s mashed in a molcajete (big, heavy mortar and pestle) instead of minced on a cutting board and it’s excellent. But I still revert to my way when I make it. Avocado-buying tip: I like the ones that feel like a Pinky ball, or with slightly more give. [Pet peeve alert!] Please don’t pull the stems out of them to check; it ruins all the ones you leave behind for others. Do you have to make your own tortilla chips? No, that’s just for crazy people and/or people who bought a gazillion soft corn tortillas a few months ago and even with a serious taco habit, cannot get through them. Should you feel so inspired, cut your small corn tortillas into 8 wedges a neutral oil, heat a puddle of neutral oil over medium until a droplet of water dropped in hisses and sputters and fry the chips, flipping as needed, for a couple minutes on the first side and usually just one on the second. Look for golden edges but take them out slightly on the pale side as they like to keep cooking for a short bit. Drain on paper towels or a paper bag and immediately sprinkle with fine salt; it doesn’t stick the same if you sprinkle it on once they’re cool. 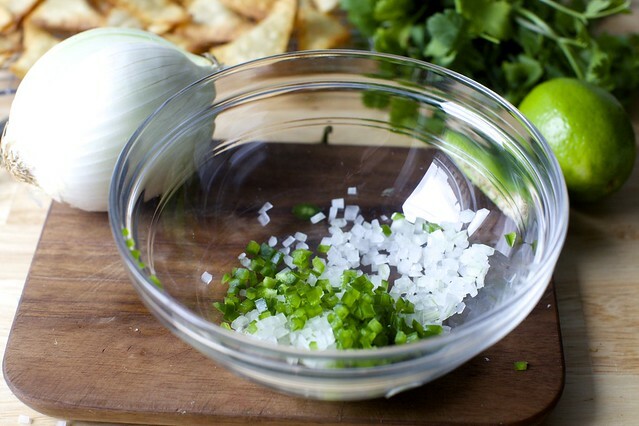 Mix the onion, jalapeño and cilantro in the bottom of a medium bowl. Add lime and salt. Cut avocado in half and remove the pit. 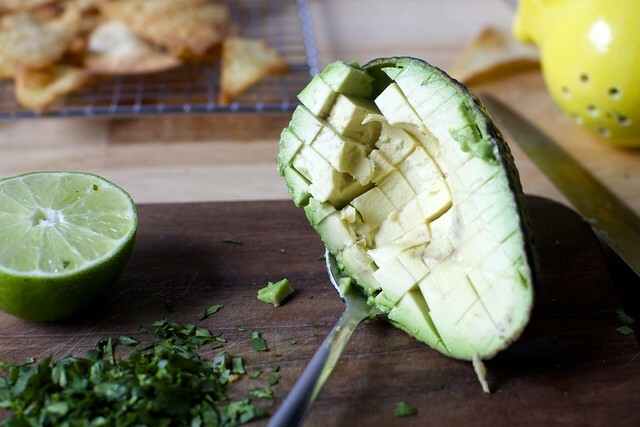 Use a knife to score each half in a grid pattern, being careful not to cut through the skin of the avocado. Run a soup spoon between the avocado and skin to scoop the chunks cleanly into the bowl. Turn them over a few times to coat them with the dressing. Taste mixture, adding more of other ingredients to taste. Use a fork to mash chunks to desired consistency, or not at all. Try not to eat this bowl by yourself, although it will be hard. I like my guacamole super creamy, not chunky. So my secret ingredient (that I hate everywhere else but love in this application) is mayonnaise! Just think how this would be using a mayonnaise made with avocado oil. Nicely circular. Yes yes yes to the mayo addition! It’s the only way I’ll eat guacamole! Totally with you on the generous lime, and plenty of jalapeño and cilantro. I do like garlic and tomato in mine, though! I’m pretty neutral on the kind of onion. Red, white, yellow, or even green on occasion are all fine with me. My friends have been holding an Annual Guac-Off for years now, like 7 or 8 (in Cambridge, MA) and I’ve served as a judge for a number of them. There have been some really great ones, like ones with roasted corn, the tropical, with pineapple and mango, the cannoli, with sweetened mascarpone, and the Italian, with pesto and sundried tomatoes. I know some people are turning up their noses as they read this, but the pea guac debacle opened my eyes to a whole new world of possibilities. And really, isn’t now the right moment in history to have an open mind? Although, I do object to my friend’s insistence on whirling his avocados in a food processor and adding mayo. You have to draw the line somewhere. ..guac-off judge? I AM SO JEALOUS. If you ever need help with your competitions, I’m available! Me too! I also live in Cambridge, MA! Hahaha. I always puzzled over the American way of flavouring everything – from coffee to popcorn and beyond – with things that make them taste quite different from the real thing. This habit has now spread to other parts of the world and I just.dont.get.it! Still, to each his or her own. PS Maybe I’m a bit cranky – I’ve had no added sugar since 31 December! I’m with you completely. Quality over quantity is not something respected here. I totally agree with you, Its even actually healthier to keep thing as natural as possible. I like almost all guacamole, although too many winter tomato chunks is a turn-off. My current favorite, quick recipe uses a minced chipotle chile in adobo (freeze the rest of the can as individual ‘doses’), cilantro, lime and salt. Not too spicy, and the lime and the cilantro amp up the ‘fresh’ to balance the spicy/oily of the chile and avocado. This is my preferred method, too! I think a smoky guac is the thing most people don’t know they are missing. Ok, now I must try this smokey guac, thank you for the inspo! That’s exactly as I read it too ! “If your avocados are ripe to the point of basically already being avocado butter, well, the avocado has chosen its textural fate and we must respect its wishes.” Your writing is my favorite thing. And, of course, your food — this guacamole looks like just what I like! I’m with you – Deb could write fiction non fiction have a column in The NY Times. She has such a way with words & her cooking is amazing. Love our blog too. I’m Mexican American living in southwest and I love all guacamole need to try this with the chipotle but the fresh jalepenos are my favorite. My mom would roast them add green onion garlic, just a touch & tomatos. Deb, you understand me. This is EXACTLY how I make mine. Heavy on lime/cilantro/jalapeno, chunky and barely mashed, and DEFINITELY no garlic or tomato (I live for tomatoes in all other applications but can’t stand the way their juices run into the avocado in guac). This is perfection. And now I want guac. Nummy and just in time for superbowl commercials day. I thought you didn’t like cilantro though… Did I miss a palate development stage? It’s a work in progress. I still do not delight in a fresh fistful of it over food but I will now enjoy it (rather than just tolerate it) with complementary flavors that relegate it to more of a supporting role. I’m trying! Love guac and Love that you posted a guac for the purists (like me!) The ombré of inside an avocado is also just so perfect, eh? Deb, have you ever made a guac ahead of time ? If so, how many days in advance would you recommend and any tricks on keeping it from browning ? I sometimes feel the need to use up those avocados before they go rogue. The vast majority of Mexican chefs eschew citrus completely in their guacamole, so this isn’t “purist” style… but simple and good for sure. A few tricks I’ve learned to keep quac from going brown – thin layer of olive oil on the top and cover with plastic wrap pressed down to the top layer of the guac. And my fav trick I learned on a trip to Mexico, cooking along side a local lady I was helping clean up and as I went to refrigerate the guac I noticed the pits were mixed in. I went to pitch these in the garbage thinking it was an oversight when the lady started speaking frantically in Spanish at me. My friend interpreted and I learned that the pits are kept in to keep it from browning. Since then I’ve always left at least one pit in when I make a big batch and have never had it go brown. Yes, growing up in California I was also taught to always leave in a pit in the mix until serving. I really miss coming home from a trip to California with a suitcase full of avocados grown by family members. For those of you fortunate enough to pack avocados in your luggage, my best tip is to put them inside your shoes! Guac freezes! When perfect avocados are plentiful and affordable I make batches, put it into freezer bags and smooth out all of the air (prevents browning). After thawing in the fridge it may need a quick stir to even out the texture, but that’s it. 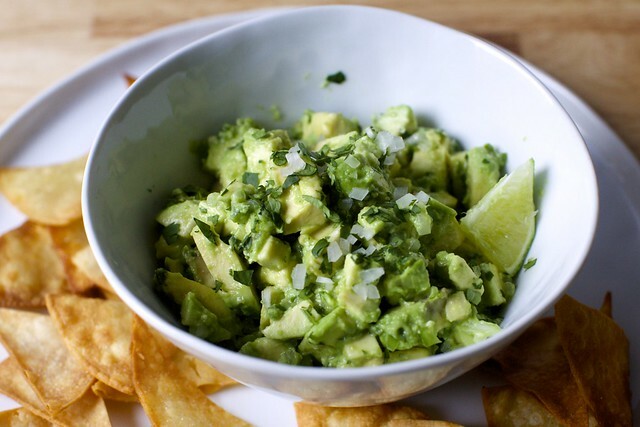 I am in the creamy guac camp, so am not sure how the texture of chopped onion would survive freeze/thaw, but just freezing the avocado and then adding fresh additions whenever you thaw it would probably work well. I make a hummus guacamole dip (yes,garlic, olive oil and lemon, plus garbanzos) & it lasts quite awhile, days. Its my idea of a high fiber riff on quac. When I serve it at parties, I’ll put a well of roasted diced jalapeños in the middle so foks can dial the heat. As a cilantro lover I can’t understand how some people don’t enjoy it. But apparently to some palates, it has a soapy taste?! If you’re looking for another cilantro adventure, the Gaon dal in Madhur Jaffrey’s “At Home with Madhur Jaffrey” uses more cilantro than any recipe I’ve ever tried. And yet it’s still subtle in the end, and really delightful. I highly recommend it! Especially served over roasted cauliflower. You may have posted about this before, but apparently Julia Child also had this genetic trait. I’m pretty much in your camp, flavor wise, tho I do mash a little more. My “trick”s are 1: I use a shallot, minced. Great flavor no leftover chunk of onion. And I buy a bottle of Coriander Chutney in the Indian foods aisle. It is a past4e of cilantro, lime, and chile pepper and keeps forever in the fridge. 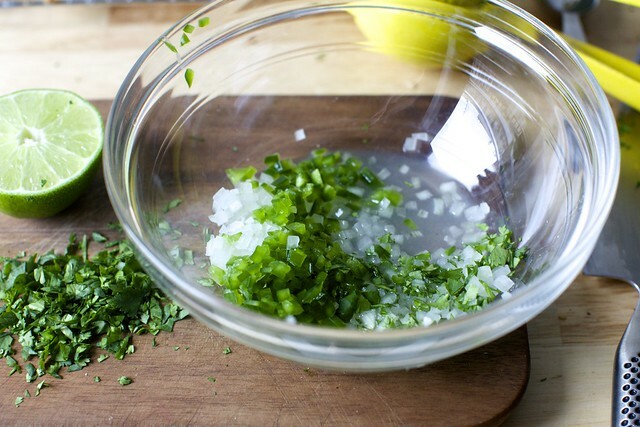 A spoonful of that, some extra lime, salt and shallot and it’s perfect: no half bunch of slimy cilantro and shriveled half a pepper in the bottom of the drawer! Coriander chutney sounds like heaven in a jar!!! It’s terrific in rice too, for burritos or whatever! Which store/s stock this variety? Looking online at Wegmans, which has a reasonable international selection, the Laxmi Brand corriander chutney has some extra ingredients like coconut and ginger, but no lime. The coconut and ginger might taste good in guac, but I was really hoping to find the one you’re raving about! This is the one, probably the one you are seeing. I only taste cilantro and chile and citrus. I have not shopped from that link, so it is not necessarily a recommendation of their site. This guacamole recipe is SO up my alley, but I do think I’d miss the garlic in it :) The more, the merrier for me! That’s how it’s made! First thing I did was check for legitimacy by seeing if you added tomatoes. I’ll never get why anyone thinks that’s ok.
One change, and you’d be right on – RED onions. Other than that, this anonymous internet troll approves. I think the tomatoes came from fat-phobia, a way to bulk it up. Or, bulk it up in a more budgeted way (although avocados aren’t expensive in California of course). Putting tomatoes in is no less purist than putting citrus in. Look up guacamole recipes by Mexican chefs and there’s rarely citrus. If you don’t like the tomatoes and do like the citrus, great–make it your way. But neither is more authentic or purer than the other. They’re both variations. I finally followed my heart and did just salt, lime juice, cilantro, green onions, very finely minced chili, very ripe avocados roughly mashed, and it’s my thing. This. Is. IT. ;)) There are probably as many ways to mix up guac as there are cooks reading your blog, right? Love THIS way. And love the suggestions – guac 365 ways for 365 days. Yes please! Yum! Definitely on the same page regarding no tomatoes, etc. The one addition I do sometimes enjoy is a few coriander seeds, mostly crushed in a mortar and pestle. Works well with the cilantro (for obvious reasons!). I love thinking of it as an avocado salad! Occasionally, in a restaurant, guacamole will be pureed so smooth that I grow suspicious about there being things in there that I don’t like – such as mayo. …or the kind that comes in the giant plastic bag at the sub shop. Ick. fascinating! I found a recipe back in the 90s and never deviated – lemon juice, olive oil, minced onion, salt, pepper. Mashed a bit. But I will try yours because you sound evangelical and maybe I could be converted. And I’m with you on generous citrus – I almost always add the zest, too, even if it’s not called for because it adds oomph to the citrus juice. This looks delicious. I also really like the glass bowl you mixed it in — I could use one that shape and size. Do you mind telling what brand/size it is? MK, the bowl looks like one of a set of glass nesting bowls that I have at home and have loved and used for years. Luminarc makes them, and so does Anchor Hocking. The latter is a cheaper set from Wal-Mart. Just Google ‘glass nesting bowls’. Feel free to correct me, Deb, if I am totally wrong. Sorry for the delay. Don’t remember which of these it was but it’s from this set. Bought them in 2014 and find them perfect for most things. You know, except the 3 or 4 I’ve broken since. My go-to guacamole consists of a container of pico de gallo (finely diced tomatoes, onion and cilantro), salt, pepper, and two medium-large ripe avocados mashed a bit more than yours but still with some chunks. I, too, will eat almost any guacamole concoction except for that disgusting runny stuff they sell pre-made at the grocery stores here in California. That’s not guacamole. I’ll definitely be testing this recipe as I love all things avocado. Absolutely agree about being generous with the lime juice and cilantro. I like to use a very fine grater or rasp for the white onion, which results more or less in juicy onion puree — you get the flavour but no chunks. Garlic (a little) goes in or out depending on what else the guacamole is being served with. I also enjoy a dash of ground cumin in mine. so, how do you check the ripeness without pulling the stems out? I thought that was the only way. You can check by carefully (!) pressing with the thumb near the stem for stage of softness. Also, you can buy several avocados with different stages of ripeness and eat them throughout the next days as they ripen. And (food sience alert…) if you keep unripe avocados in one bowl with apples those avocados ripen faster due to the ethylene that evaporates from the apples. Part of the trick is finding out in which stores this method will get you ripe avocados, and which stores it will get you avocados that are going brown and spoilt. I like it your way, too! Chunky and limey, yum. Sometimes I’ll add a little cumin or even a sprinkle of smoked paprika. Is that weird? Sometimes I want it chunky. Sometimes smooth. It depends on the avocados. Here, one must make do. Years ago, I had an avocado tree in my front yard, and things were different. I can go basic (avocado, salt, pepper) or all out, with cilantro, tomatoes, red peppers, lemon or lime juice and who knows what all. Open door! Chips should be up to the task. If you are disappointed, they are the first to blame. This former Californian disagrees with you on the garlic. I usually finely mince (almost to a paste) a large, mild clove for every two avocados or so. And I grate my white onion so you get the flavor but no crunch. I’m sure I didn’t come up with that on my own, but can’t remember where I read/heard the idea. Other than that, all I add is salt and lime juice. I am totally with you though on the start-more-chunky-than-you’ll-want-since-you-can’t-unmash concept. A nice mix of chunks and the natural smush level you get stirring everything together gives me my ideal texture. Chunky not creamy, red onion, lime, glug of olive oil, sea salt and a couple pinches of cumin. Now I’m thinking about your avocado-shrimp salsa. I wish I had avocados. And shrimp. It’s too cold to go back outside, so I’ll have to wait for another day! I can’t eat onions, so I can only trust guacamole I make myself. I like chunky avocado, lime, a lil bit of sour cream, and garlic salt. It’s basically just avocado on chips. This sounds just about right to me. It is amazing what just a little sour cream can do…my dear mother in law taught me that. The only thing that really drives me wild with guacamole is when someone has to make it super spicy. Guacamole is there to have something cooling with your spicy enchiladas, etc. It absolutely ruins it for me if it is spicy. Avocado has to be in my top ten favorite foods. Winter is worth it because of avocados! Thank you for the great recipe, Deb! If it has avocado in it, it must be delicious! I totally LOVE your recipe and it is exactly how I would make it, chunky and tasty! and “yes” I would probably eat it all with some nice crispy chips and a nice cold Margarita on the side…cheers! The guacamole looks absolutely delicious! And little Anna just gets cuter by the day! OH My Goodness, she is precious!!! I would eat guacamole with a monster any day as long as they can share. But didn’t you know? … the only , Only right way is red onion. Haha, I love my guac with tomatoes, red onions, AND garlic. This looks fantastic for when I want a more classic guac, I’ll need to give it a try! I’m in total agreement. Chunky. Guacamole is so context sensitive and so I think that is the reason there is no “right” recipe. This sounds a little chunky for dipping – I’m in the slightly smushy school of thought. But garlic, red onion, bit of jalapeño, cilantro and lime as an appetizer. Just the chunky avocado with lime and salt when topping Mexican food that already has spice or cilantro as a contrast. I love guacamole so much, and now I feel like I have to run to the store (in the middle of the night) to grab an avocado! Can’t wait to try this “refined” version lol. I make Ina Garten’s chunky guacamole all the time. My coworkers beg me to make it! I do put garlic in it-will give yours a try. I learned to make it the traditional Mexican way( ex husband) tomatoes, garlic, ( some argue lemon) lime, onions, cilantro and a bit of jalapeño. I always have people ask me why my guacamole tastes so good, I think it’s lots of cilantro. That being said this version looks fantastic. I don’t like it too smooth and never with sour cream or mayonnaise. Who am I kidding ? I love avocados! I’ll pretty much eat them any chance I get. I look forward to trying this recipe! I know I’ve said it before, but you never let me down Deb! I married into a Mexican family, and they always put garlic in their guac. Why the hate?! ‘The avocado has chosen its textural fate and we must respect its wishes’ is the best line of food writing I’ve come across all week. I cannot stand cilantro. What’s a good substitute? I, too have strong opinions on guacamole (among other things!). In Mexico they serve it as a foil to the hot spicy salsa so it’s always cool and creamy so as to quench the burn. So no jalepeno. Always lime. Skip the cilantro. It’s in the pico! A little onion for flavor and just slightly chunky. The first time I saw it made was by my boyfriend at the time, who squeezed the browning flesh from its shell, with a stem, into a bowl, and proceeded from there. I don’t know what happened next; he lost me with the stem. But your recipe — the “salad version” of guacamole — that looks good! I’m game to try it, except for the cilantro. Cilantro tastes awful to me. But I could do the rest and I’ll bet it would be delicious. It could be my gateway guacamole. Nice knife skills, Deb – look at that brunoise! Guacamole made by someone else’s hand is still guacamole and I’ll eat it regardless — yours is very similar to mine, but (egg on face) I do use seeded diced tomato in mine. My husband is in charge of the mandatory Margarita chaser. Love guac, and the picture of your “mature” little one! Wow very impressed with your mincing skills. So small and uniform. I grew up watching my Mom read cookbooks like novels. Then she’d take something from each and make the most wonderful dinners! She would have loved your books, Deb. So that’s how I will approach my guacamole for tonight; my fav recipe is from George Stella I’ll marry the best of yours -the lime dressing first, and his—a dab of sour cream but holding off on the garlic until I can’t help myself and mash a bit in anyway. Mom loved garlic, and her daughter does too. I made it just like this last night but confess I do like chopped tomatoes in it. The acids contrast nicely with all that yummy fat. One of the best foods in the world! While I will not debate you on the “correct” way of making guac, this sounds delicious, but is indeed an avocado salad not guacamole. That being said, I often make this and it is lovely. I’m sorry, but I’m going to have to follow along on the low road. You New Yorkers lost all credibility on how to handle an avocado after the pea incident (which I attribute to your lot only having access to sub-par avocados). I say do as above, minus the onion, add one minced tiny garlic clove, and you don’t even need the jalapeño. Or that much lime. Perfection and the taste of the avocado is left alone to shine. I always wonder what goes through Melissa Clark’s head over pea-gate… She actually published the recipe in 2013 and it’s not hers but a famous chef (Jean-Georges Vongerichten), who never called it authentic guacamole, nor did Clark, but just did his own wild version of it, as chefs always do. Then, over two years later, the internet (and presidents too) goes nuts over it and she becomes this pariah who doesn’t understand guacamole. [It probably doesn’t help that the way the NYT publishes recipes, the writer that wrote the article of it becomes the recipes’s “author” and not the chef who provided it, see here.] it Anyway, not here as a Pea Guac Apologist or anything, but it always did feel like one of those things where the reactive roar of the viral internet drowned out any nuance in the origin of the recipe. I have to say, after writing this comment I proceeded to make guac for the first time in my new home in the Midwest (moved from CA). Unfortunately I discovered that you have to up the salt/garlic/lime to avocado ratio the farther you get from CA or Mexico. These avocados are sad! I made the pea faux-guacamole. Once. Garlic is the crowning glory of guacamole! Wouldn’t think of leaving it out. And now, Deb how about a good recipe for a Paloma? I have never had any success making them at home. Margaritas are easy, but every once in a while you need a refreshing Paloma! LOVE this – my housemate is obsessed with avocado so I will definitely be impressing her with this guacamole soon! now if I only had some idea what a Pink ball was. Hard like a super ball? soft like a nerf? Think: medium-firmness rubber ball. You have to press to get it to indent and it bounces back. Obviously an avocado won’t bounce back but you want one that feels firm until you press medium-firmly on it. And Pinky balls are the best! I just assume everyone had them growing up. Avocado: okay you were in the bathroom so I rotted. Hope you think it as humorous as I did. I don’t know what Deb thinks of this, but that is the best laugh I have had this year…thanks!! I feel this way about pears. Avocados have a little more leeway (1-2 days) if you put them in the fridge when they first start to soften. This is 100% true. I’m currently having the same issue with tommy atkins mangoes. And bananas, always. And pears too! They’re never actually ripe, except while you are sleeping. They go from rock to fermenting pulp in a heartbeat. I do love cilantro in Guac and anything else it can possibly be added. I accidentally found a way to keep it from becoming the slimy mess before I can use it all. In lieu of a plastic bag, I stuck a bunch in a plastic storage container and lo and behold a month, maybe more, it is still fresh, dry and not slimy! Hope it works for others. I’m a weirdo who hates onion & cilantro, so I pretty much like just mashed avocado with a little bit of lime in it. Hi Deb, I just wanted to tell you that every recipe I’ve tried from your cookbook has been a success! Tonight I’m making the wild rice gratin and I can’t wait to try it. Thanks for including many vegetarian recipes. I did make this but I did add roasted garlic which I roasted as a cut half a bulb and poured olive oil over the cut top, wrapped then entire thing in foil, tightly and roasted at 425 for 45 min. It was like toothpaste consistency and I squeezed some into the guac. not the entire half bulb. It was not pungent but sweet and a hint of maybe garlic or something else which was very nice. Roasted garlic is not the same animal as raw garlic. It’s different and very nice…mild. I too have strong opinions on guacamole, in that I think it’s icky. My guac-loving friends will appreciate this at my next Tex-Mex Fiesta Extravaganza Night, though! I always use onions and garlic in my guacamole. To take some of the bite off I boil two cups of water, place the minced onion and garlic in a strainer, pour the boiling water over the mix and immediately rinse in cold water and drain. By the by I do use tomatoes but you have to get rid of the pulp and seeds before chopping them. The one and only food blog I follow – so many great food ideas and fantastic writing. As a Scottish lass following your country’s news with increasing horror, I must admit to visiting on your page hoping you’d hint at something…and I think you have with a classic Mexican dish. Thank you and when he comes for a visit here I’ll be one of those out on the streets saying ‘no thanks’! 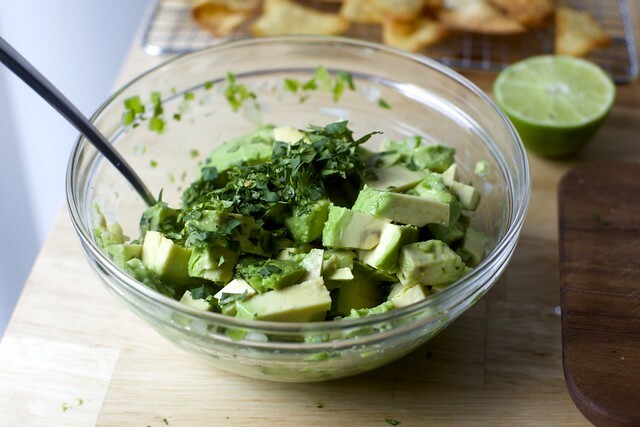 I love the guacamole, but I hate coriander (cilantro) – so while I totally plan to make this – it has lime in it (I adore limes) There will be no evil weed in it! I thought, “that’s pretty basic, Deb.” Nonetheless, I had a couple of avos more than ready to go so I grabbed a white onion, lime and cilantro and threw together some imperfect guac. It was a revelation. I ate all of it. By myself. A whole batch. Alone. The white onion seals the deal because its mild flavor lets the other ingredients shine through. I’ll have to double the recipe in the future in case it has to be shared. No matter how good it is for you. I will try it this way. Maybe I will actually like it, which would be a good result. I love your passion for the topic. It is a very personal thing. However, you must try swapping out the lime for lemon. It is so much better IMHO. Ever since I saw Eva Longeria’s insistence on lemon (and is of Mexican heritage), that is the way I roll. Just try it. I’ve never liked tomatoes in guacamole but the texture always depends on what i’m having it with. This chunky bowl is really beautiful to be eaten alone and your writing style is glam. While I normally mash it a bit (but still prefer chunky!) 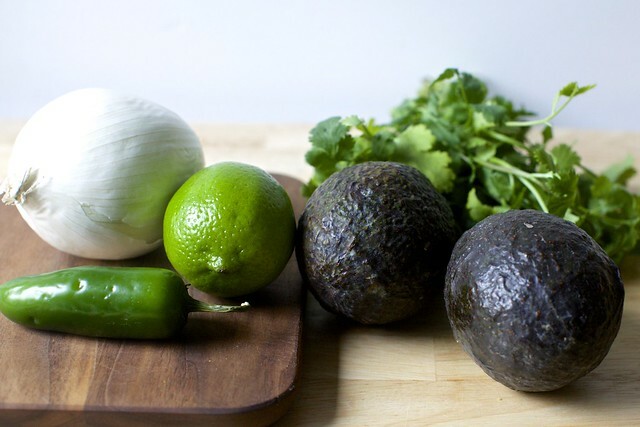 these are the correct ingredients for best guacamole. I am definitely behind Deb and the minimalists when it comes to guacamole! However, I do put in a leetle clove of mince garlic because I like it. I make my own tortilla chips too! I find it easier to fill a stock pot with an inch or two of oil, and dump a stack of cut tortillas in all at one. Then I smush them down with a spider wok. It should be bubbling like boiling water. After two or three minutes you can drain and salt them on a paper towel. This way I avoid the chewy centers! These are the same ingredients and proportions we use, but I do a quick mash with my pastry blender. I am totally against tomatoes and garlic because I typically serve the guac right next to pico and there they are. I thought you were one of those non-cilantro people and it tastes like soap to you? I made almost this exact recipe (sub red onion for white) for the super bowl yesterday. It was demolished before the halftime show began! Were the tortilla chips in the image made according to the recipe you posted? I make my guacamole with the same ingredients but backwards. I start with the avocado, sprinkle on the lime juice, toss. As I add the remaining ingredients I toss after each addition and between tossing and gently mashing against the side of the bowl, the very ripe bits get mashed and it remains as chunky as I like it. Taste it! If it’s bland, add a little salt and lime. Yes! this is pretty much my go to way of making guacamole. I always add half a teaspoon of sugar, though. You don’t perceive the sweetness, but it binds the other flavours. also, for 2 avocados I wd use 1-1.5 limes. Also, for another variation – caramelize the onion! – crazy but fantastic. Okay, so I admit, I was pretty skeptical about this one. No tomato? But I thought, why not – avocados at Whole Foods were on a crazy sale (under $1 per avocado!) so I bought a bunch and made this guacamole for the Super Bowl party I went to. IT WAS A HIT. I think it was the unclutteredness and the ample lime juice. I also didn’t add jalapeno, because I didn’t have any, so it wasn’t spicy at all. Nice job, Deb. I made these last night for the Super Bowl. I quadrupled the recipe and made the sauce first. Then I discovered that only 3 of the 8 avocados on hand were the right ripe! I tediously scooped the good out and trashed the overripe. The result was a guacamole that tasted delicious even if the texture left a bit to be desired . Ah. I see we disagree on guacamole. I like it fairly smooth and I do put tomatoes in, but I have to say, I chop them SOOOO super fine that you wouldn’t know it exactly. Just adds a great little bit of flavor. I am an avocado fanatic. And a few years ago, I stopped buying them ripe at all. I now buy only the firmest greenest ones and wait for them to ripen at home. That way, no bruises from travel or other people squeezing them to check for ripeness. They’ll ripen in a few days and if they all ripen at the same time, pop them in the fridge at the peak of ripeness. They’ll last a week that way. In nine years of reading SK, I have never laughed so hard as I did at this. May my guacamole be as salty as the tears falling down my face. I very much appreciate the variety of complexity this site offers! There are, in fact, two quesadilla recipes in the archives. Not all cooking here is complex. Thanks for this. A much-needed celebration of diversity and tolerance for others’ opinions, and at the same time an ode to our Mexican friends neighbors. I am taking this to be intentional, and enjoying it a lot. For what it’s worth, I once worked for a summer with a woman from Monterrey, Mexico, and she insisted that guacamole should have “the three colors of the Mexican flag.” This was the justification for adding chopped tomatoes, and white onion. Chunky is the best! I don’t mash at all, just stir enough to break up the chunks. I don’t like raw onion so I use scallions. Other than that, though, this is how I do it. (Admittedly sometimes I do add some chopped grape tomatoes.) No garlic! I made this for the superbowl – terrific! I always leave my guac simple, but this was even more simple (no garlic!!) and tasted great. Funny story – a few weeks my mother-in-law handed me an avocado and asked me to make guacamole. I did, and put it on the table. We sat down to eat and she had fits because I left out her key ingredients…sour cream and cheap, grocery store salsa. Ew! I use a potato masher to mash mine to the perfect chunky/smooth balance. Works perfectly, rapidly. My husband and I also love to make our own chips, mostly because it prevents me from eating an entire bag of tostitos. We bake them on a foil lined sheet, spray with PAM and sprinkle salt and onion powder. They are crunchy and perfect, I promise. Yummy. Your way is much closer to how they do it in Mexico, actually. Or at least, in Sayulita, which admittedly is a pretty gentrified little town thanks to the hordes of ex-pats who live there and the vacationers, like us, who escape there. But dang, that was the best guac I’ve ever had and we have been making it the Sayulita way ever since. I think of this kind of thing more as a relish (I use it to top enchiladas and such) instead of a dip. To each their own! How do you mince onion that tiny and that perfectly?? Because you posed white onion, I divided a batch in two — one with white onion and one with red onion. Alas, red onion readily won the taste test that followed. Revisit fan? Re, white onion — everyone knows I mean white-skinned onion and not yellow/brown onion, right? I love that you did a taste test. Deb, I think this commenter means revisit flan. This is probably going to make you wince, but this is how we like guacamole: Peel avocados and place in bowl. Add just enough lime juice so it can barely be tasted, only in the smallest way. Add salsa (commerically made is fine. Our current favorite is Pace Picante Sauce, in a small amount. Smash with a fork. Taste. Adjust the lime and salsa as needed. It is not authentic, nor is it gourmet. But we like it, and it is quick to make. Personally, I’m a big fan of white onion rather than red since it has a bit more intensity to it. I was wondering, has anyone ever tried making Guacamole with tomatillos? I have some cousin’s from Mexico city and they taught me their recipe which involves including as many tomatillos as avocados. Kind of a guacamole/salsa hybrid when finished but I’ve never tasted something so fresh. That looks delicious, but my Mexican sister in law insists that the only correct way to make guacamole is to mash an avocado with salt. That’s it. Maybe a squirt of lime juice if you aren’t eating it immediately, but in what kind of crazy universe would you smash up an avocado and NOT eat it immediately? I make a killer guac’. Mash with a fork a ripe avocodo so there are chunks, add some pico de gallo and mashed roasted garlic and lots of salt and a dash of Worchestershire sauce and a nice squeeze of lime juice. Mix and serve cold with chips and beer. People. Where y’all get did this idea that adding citrus to guacamole is “purist” but adding tomato isn’t? If you like adding lime, go for it. You should cook and eat what you like. But it doesn’t make you or your guacamole any more “purist” than putting tomato in it. Or garlic, for that matter. I’m a Texas girl and here is how I make Guacamole: With a fork, mash the avocado with lime juice and salt. That’s it. Delicious. Onion, tomato, jalapeno and cilantro are all in the Pico that I serve along with it. Once, I gave my Grandson sliced avocados with his supper. He wasn’t eating them so I asked him if he didn’t like avocados. Oh I like them he said, but I am used to eating them in guacamole. I reached over to his plate with a fork and smushed up his avocado slices. There, I said, guacamole! I use a liquid-y paste of grated onion, grated garlic, salt and lime juice (to taste) to season my guac and it always turns out perfect. SO good, mostly smooth. Don’t knock it till you try it- lol! Lisa; Try it with roasted garlic. I cut 1/3 of the garlic head off and pour olive oil over it and then salt and roast it in the toaster oven, wrapped in foil for 45 min at 425. It is the texture of tooth paste. This is what I use in my guac. I make it to taste. This is delicious! thank you. We love the lime (and lots of it). My mother made a strange but very successful addition one year: instead of jalapenos, she used ground cumin (and lots of lime). Now we all love the cumin and lime combo too. I love my guacamole clean. Nothing making it muddy looking! Just a beautiful green! Avocado left chunky, a little kosher salt, 1/2 of a squeezed lime per avocado, and maybe a touch of cayenne sprinkled in. This is how I had it made, at my table, in a restaurant in San Antonio. The freshest and best! I ordered the autographed copy of the new “Smitten Kitchen “ I have not received it. Where do you see one? Ha! Hot sunny day in Northern Ontario at a friend’s cottage. BFF says without toms, I say with, so we have a contest…8 volunteer tasters. Sorry Debs, with toms won…even BFF had to agree mine was more….guacamole! Having said that, the best guacamole I have ever tasted I was in a restaurant in Utah called Cafe Diablo, and they did it your way. I do love lots of your recipes and do have 2 copies of your first book…one hardback and a kindle version which travels with me. The only ingredient I would add to this awesome guac would be a full pinch of freshly ground cumin (this is where the mortar and pestle are useful).